The Holidays are in full swing over here!!! Lately I have found my to-do list has pretty much tripled and the days are flying by……anyone with me??!! In the hussle and bussle of the season often it is easy for those extra pounds to pile on. Delicious food is pretty much everywhere and temptation to eat a little bit of this or a little bit of that is super easy! I get a lot of questions during the season how to stay healthy and keep those unwanted pounds at bay! Never fear….. your Dietitian is here to walk you through 4 simple shifts that I use personally to keep myself in check and easy to integrate naturally so you don’t feel like it’s really effort. The most important recommendation is to fully enjoy the holidays and the time we have together…..tis the season in a healthy way! In the holiday hussle it is easy to forget to eat or stop long enough for a meal. Often breakfast tends to be the meal skipped as we fly out the door with a million things on our to-do list. This is where a little pre-planning and easy on-the-go breakfast items like the Bob’s Red Mill Muesli cups come in handy to jumpstart the day and provide the energy our body needs. Striving for a balanced breakfast, two key nutrients to consider is protein and fiber in the morning meal which both help stabilize blood sugar levels and keep our metabolism humming until the next meal. If the breakfast meal is skipped, often we find ourselves famished by 11am and overeating at lunch so kickstarting the day with a healthy, intentional breakfast is important when keeping body weight managed. 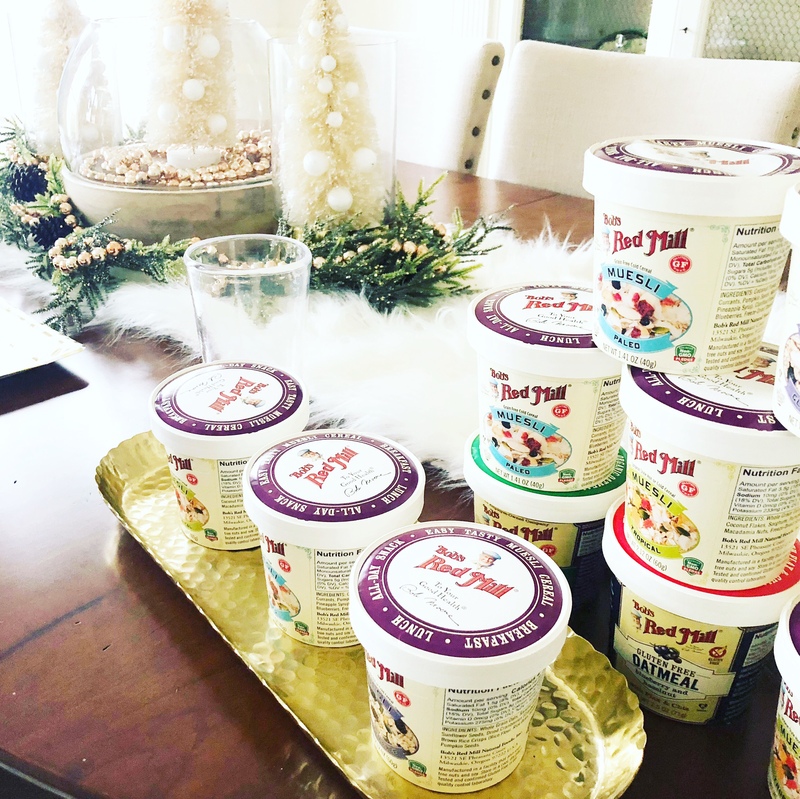 Anything quick, portioned, and full of nutrition is what to keep on hand and that’s why I am loving the Bob’s Red Mill Muesli cups this season. They have a great combination of fiber and protein, they are portioned, they come in gluten free, paleo, or vegan friendly options and they can be enjoyed hot or cold, or even as a snack to bridge the gap between meals, very versatile!. Try making a holiday trail mix to keep on hand as a healthy snack idea. 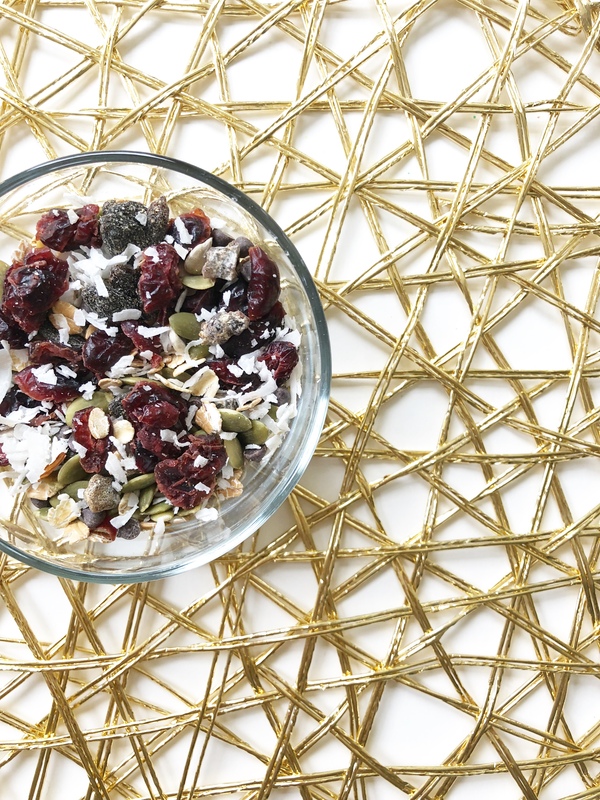 This Holiday Museli Trail Mix Recipe is easy to throw together and delicious. 1-2 tbsp. mini semi-sweet chocolate morsels. Mix all ingredients together an store in air tight container. Anything that can be planned and prepared ahead of time makes it easy to grab-and-go the next morning keeping the morning meal a priority and healthy. Easy ideas like boiling a dozen eggs ahead and storing in the fridge is good lean protein, pre-chopped fruit, yogurts, and meals like overnight oats or chia puddings are all easy breakfast ideas that require just a little pre-planning. This Pomegranate Raspberry Muesli Chia Pudding Recipe takes about 5 minutes to make, store over night in the fridge and voila you have a super healthy breakfast ready to go the next day. Mix everything together in glass, cover, and store in the fridge overnight. In the morning top with fresh raspberries, pomegranate seeds, and grab a spoon. All the parties and festive gatherings can add up during the holidays but a solid holiday strategy going into any holiday gathering can help you stay focused, not feel deprived of the fun foods or drinks, and have a good time. One personal and simple shift I like is swapping out a large dinner plate for a small cocktail plate. Just this simple shift will naturally keep portions under control and no calorie stressing required. The second shift I personally do is go for the fresh first and fill half the plate with all the fresh vegetables and fruits. This simple strategy fills the plate fast, looks like a lot on the plate, boost nutrition, and leaves a small amount of room for any other festive food to enjoy. Mindful drinking during the holidays is another shift that takes a little discipline but really helps the empty holiday calories stay away. First, water and hydration are key and I recommend to strive for at least 60 ounces of water a day. Staying hydrated throughout the day will help with energy and weight management. Personally I like to drink a big glass of water before I go into a meal setting, this helps fill space in the stomach so I don’t feel overly hungry and less likely to over eat plus it is just good, simple hydration the body needs. When it comes to festive libations it is easy to drink half of your daily energy needs in empty calories. Holiday beverages can pack in hundreds of calories fast and it’s easy to lose track how many drinks we may have in all the festive fun. This is where I love to slim down any cocktail I can so I still enjoy the festive drinks just in a lighter way. One of my favorite lighter libations is a wine and fruit spritzer. 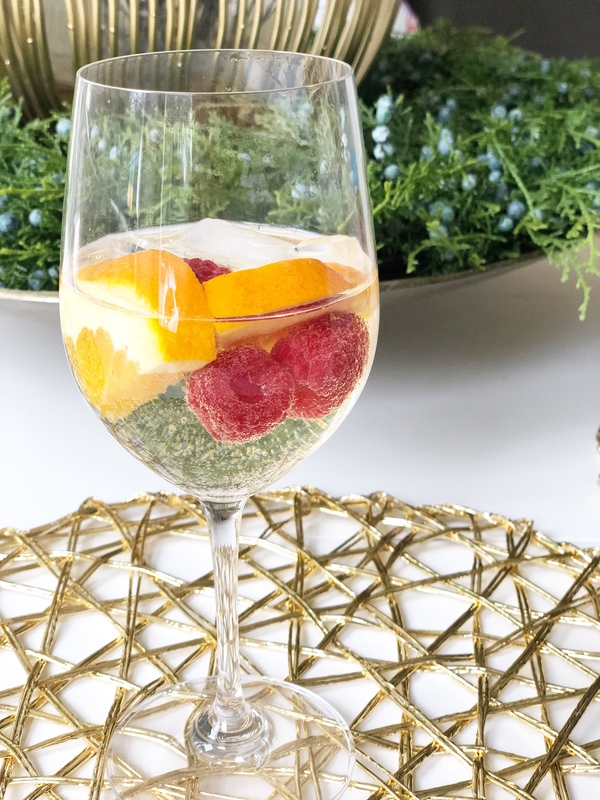 A wine spritzer cuts the wine in half using club soda, fresh fruit and ice so the glass is full! For one glass of wine you can have 2 wine spritzers so it feels like more for less, big WIN! I encourage to look for simple ways to lighten up any cocktail when you can and use good self control when it comes to alcohol. Cheers! Good news, no holiday food is off limits! Yup, all holiday foods can fit into a healthy eating plan, it just takes prioritizing which holiday foods you love the most. I like to visualize a bank account and spending money. When investing in something you really want, it is money well spent with great intention and joy. A similar parallel can be made with eating foods that are not on the nutritious side but delicious side. When faced with a smorgesboard of holiday foods, try picking the foods you love the most putting those calories in the prioritized foods instead of choosing everything. Ask yourself, “Where do I really want to invest my fun calories?” Maybe you love pie and bread but you really love pie more and would like to enjoy a dessert, then try to forgo the bread and have a small piece of pie investing in a dessert, not depriving yourself, and savoring each festive bite. When the weather shifts to cooler temperatures the temptation to curl up under a warm blanket, watching movies, and sipping hot tea sounds really good. Although there is a place for that down time and self care for sure, it is important to keep moving. Going to the gym may not be realistic during the busy holiday season and weather may not be condusive to exercising outside but I encourage get exercise in however you can. Moving the body daily for at 30-60 minutes can help maintain a healthy weight, keep energy levels going, mentally healthy and immune boosting, and overall good for the body. If a solid block of time is difficult to find, I love to recommend the 10x10x10 rule. This is three ten minute pockets of time during the day where the body and heart rate get a boost in activity and a little sweat. At the end of the day an accumulation of 30 minutes is accomplished. Personally I love to dance to I will pop on fun music and dance away in the house to fit in daily activity. The most important thing to remember is to keep moving daily, especially during the holidays when it’s easy to gain a few extra pounds. So enjoy the holiday cheer all around and make simple healthy shifts along the way, happy holidays everyone.